While I’m still waiting to see some action on the East City Way on my own doorstep, I’ll be happy to see the proposals for a ‘Cycling Village’ to be developed around the area of Yorkhill, Kelvingrove, and Finnieston. I currently have to cover the first few miles on normal roads (although I have found some rat runs that avoid quite a lot of them now) before I can join the segregated routes at Parkhead, after which I get to the west end, and beyond, on various cycle routes which avoid most traffic. These areas are already reasonably well provided for by existing cycle paths/routes, which are so popular that I often come off them and use the road if I’m in a hurry. On nice days, they just get too busy, and unless you’re ‘Lycra Lout’ ready to speed through everyone else at a ridiculous pace, you just have to go with the flow. The various pieces of the plan have appeared in various articles over the past year, and look as if they should deliver an improved experience for everyone moving through the area, on foot, or using wheels (any sort). The plan is still a couple of years away from being completed, assuming it gets both the go-ahead and raised the required funding. What worries me is that it could be delayed if special interest and various activist groups get their hands on it, start submitting complaints and requirements on the basis they have been forgotten or ignored, and keep the plan circulation around the approval loop for years, as happened with the Sauchiehall Street ‘Avenues’ project, which I think the council eventually just got on with after a while, as the naysayers carried on whining and complaining. Members of the Yorkhill and Kelvingrove Community Council are preparing to send their proposal, the Cycling Village Project, backed by Glasgow City Council, to the Scottish charity next month. The plan has to cost more than £2 million – with the community council hoping to secure up to £8m – and Sustrans will choose how much to allocate before the local authority match it. The community council’s pitch will be sent by April 23 and if successful the project, which aims to improve the streetscape of Yorkhill, Kelvingrove and Finnieston by making them safer and more attractive, will be completed in two years. The aim is to ensure visitors and residents can discover and enjoy the area, while making pedestrian and cycling needs a priority. It will also allow people to move around easily between their homes, transport hubs, community facilities and local businesses. To achieve this vision, the group is pursuing ways to improve streetscapes, provide more cycling facilities including connections to promote already existing routes, enhance architectural heritage and introduce green elements to the local environment. The community council also hopes to link together the three national cycle routes, through Kelvingrove Park , along the Clyde and the West City Way. The organisation will also try to develop a driver awareness scheme for those who are uneasy overtaking cyclists. They also plan to make the area more wheel user and autism friendly. I caught these glasses (an old sign for a Glasgow optician) by chance a while ago, and that first pic was an absolute disaster despite being taken with a ‘proper’ camera which is supposed to cater for extremes automatically. The illuminated eyes within the frame burnt out completely, and there weren’t even pixels to be recovered by processing the original. When I recently managed to make a trip to Kelvingrove while it was actually open, I was standing in one of the galleries and realised I was looking at the same sign, but from the other side. While it’s a lot better than that first capture, which I put down to the better lighting conditions from this ‘other’ side, I’m personally still calling it a ‘fail’ as so much of the eye detail is STILL burnt out, so much so that although it looks better, there was still little to lift by further processing. Once a pixel is burnt out, it’s burnt out, end of story. Unlike underexposed shadows, where detail can often be lifted, a 100% white pixel is always 100%. Maybe third time lucky after learning – next time I’ll shoot from this same side, but either hit the exposure compensation to knock it back a little, or be naughty, and switch to spot metering and expose purely for the eyes. Kelvingrove Museum and Art Gallery – at last! This is really the image that should have been in last night’s ‘Riverside – at last!‘ post. It wasn’t, simply because it was too late to carry on past Riverside, and get the pic I really wanted. So, although it doesn’t make a great difference, I couldn’t have said this was the first day I could completed a trip that began on 05 June. The special Mackintosh event is still running – I never expected to see that. Just for fun, since I’m slowly mastering perspective correction, I thought I’d see how well I could correct a façade view of Kelvingrove’s entrance. It’s so high to the tips of the two spires that it’s almost guaranteed that even with a decently wide lens, you’ll still have to tip the camera back, even just slightly, to get it all in, and that brings the lovely converging verticals. You also have to remember to make ‘best effort’ to maintain left/right symmetry/alignment. I may be commenting on my own effort, but overall, even I’m impressed by how this one turned out. Ignore the black bit at bottom right – I didn’t claim it was perfect. On the other hand, I am slowly beating my OCD into submission, and no longer wait for hours until there are no bodies in the pic! Boy, does this save time. 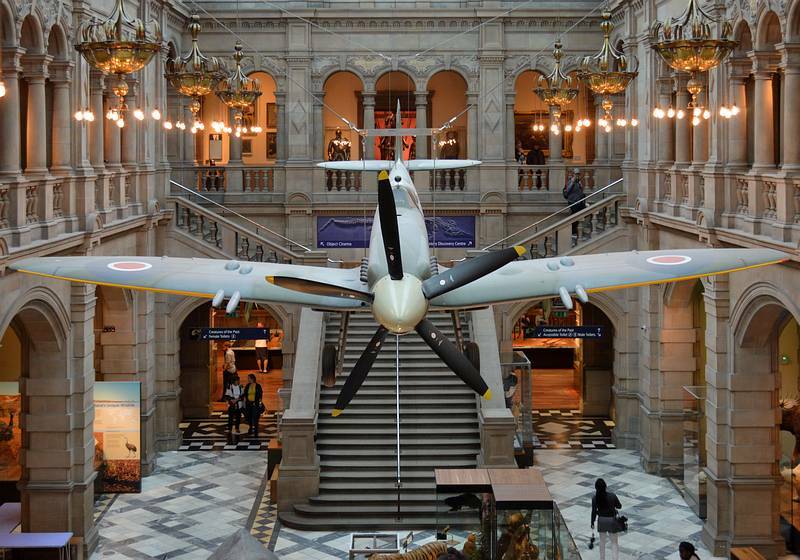 Not a new picture, but not all that old either – the gallery where Glasgow’s Spitfire LA198 is housed. A late model Mark F21 airframe fitted with the more powerful Rolls Royce Griffon engine, as opposed to the Merlin, it flew with 602 City of Glasgow Auxiliary Squadron between 1947 and 1949. LA198 was eventually placed in storage, then spent three years as a gate guardian at RAF Leuchars during the 1980s, I’ve read that 602 pilots were the first part-time squadron to be equipped with Spitfires on 8 May 1939. When I took this pic there was a sign posted nearby to the effect that this gallery had just been re-opened to the public, having been closed for some time for remedial work. I’m guessing this referred to the floor mounted displays and cases – as I took a few pics of the aircraft, I couldn’t help but notice that some years must have passed since it last saw a duster. Not a complaint in any way (it is hanging from the roof after all), merely an observation. The idea behind the pic was to see if it was possible to get a centred and symmetrical shot from the upper balcony. It seems it is, and the only thing that is ‘off’ is the 5-blade propeller, which has settled a few degrees away from vertical. The original pic was surprisingly close to ideal, and needed only a few degrees of correction for converging verticals (which was the photographer’s fault, for not holding the camera properly). I should also have been a fraction further to the right, but this detail was just too fine to see in the viewfinder. The museum staff seem to have done a VERY good job of hanging the airframe to ensure the wings are truly horizontal. I had used the tailplane and vertical fin as my references to line this one up. Click on the image for a slightly bigger version. Just to be different/awkward (and avoid ‘just’ having the same pic as everyone else, I thought I’d point the camera at the cockpit and aerial suspension system. It didn’t quite come off perfectly, as it was just an afterthought, but I did catch the bits I was interested in. Maybe I’ll take some proper pics if I get back. The cockpit and upper suspension yoke (and you can probably see the need to fly someone up there and give the canopy a once over with some polish 🙂 ). This view of the lower wing root suspension is even worse than the first (I almost missed the upper yoke!) as I was so busy looking at the wing root I forgot to keep the camera level. Let’s call it intentional, and meant to portray the Spit in a dive – or maybe I’ll just level the pic, since it portrays something hanging, and just looks ‘wrong’ with those cable lying at an angle. (So, I levelled, but couldn’t crop fully and had to edit a little, or lose the periscope mirror). I was sure I had some earlier pics (taken at the re-opening of Kelvingrove), but guess they are on film, so not readily to hand. The reason I wanted to dig them out was for comparison. Stuck in my mind is the image of a number of missing screws I spotted in the pics I took on that opening day, and this new shot clearly shows that nothing is missing. One day, I’ll get around to digitising my film pics, and will have to check this out. While tourists and passing visitors to Glasgow may have to make do, or be satisfied with as little as one visit to Kelvingrove Art Gallery and Museum, as a native Glaswegian I’ve spent a serious part of my life there, from being dragged around when I could barely walk, then as a regular visitor until I was priced off the road some years ago. Public transport’s just not convenient from where I live, so I missed out for many years, with only a handful of trips since it re-opened following its refurbishment and expansion. I used to know the place by heart (and I’m going to upset a few people, as I have to say I preferred the more formal presentation of the past – I find the simplistic ‘child-friendly’ presentation favoured by such venues these days to be disappointing), and have still to develop anything like the same familiarity with the revise layout and content. For example, although I thought that by now I’d seen everything – I clearly still have corners to explore, as I was surprised by the appearance of this (which I though might be depicting one of the city’s Buckfast drinkers). That’s a wicked grin, AND a Mohican (or Mohawk) haircut too! Clearly, I have to make the effort and get back there more often, to see what I haven’t seen. 18 May is Museum Day. Sad to say, it seems that there are millions of people with direct access to museums who have never even visited one. There are many possible reasons for this – they may think just looking at old things is boring, or perhaps they are unaware just how different the world was in the past and see no reason to take interest. Regardless of any reasons not to take advantage of the incredible amount of tangible knowledge museums offer, and regardless of age, Museum Day is the time to invest in education in its most fascinating form. And never forger that in Scotland, entry to National Museums is FREE! I don’t often offer advice, but in this case I have to say that FREE ENTRY to Scotland’s National Museum is something that should not be taken lightly, or not used to the full. As someone who has done this for all of their life, from early childhood, and still does as often as possible, I can’t describe the sheer HORROR of visiting museums in England and Wales, where every visit is met by an outstretched hand demanding cash before you get in – every single time! From the relaxed ramble around museums north of the border, a visit down south becomes a major exercise in navigation and planning, to make sure nothing is missed, or another admission fee has to be found. Compare that to visits to – in my case – Glasgow’s museums, where I can drop in every day, or just go there for a seat if I have to wait for an appointment. The Winter Garden at the People’s Palace on Glasgow Green is handy for that. The International Council of Museums (ICOM) created International Museum Day in 1977. The organisation chooses a different theme for the day and coordinates every year. Some of the themes include globalisation, indigenous peoples, bridging culture gaps, and caring for the environment. Every year since 1977, all of the museums in the world are invited to participate in this day to promote the role of museums around in the world by organising enjoyable and free activities around the year’s theme. International Museum Day has become steadily more popular since its creation, with International Museum Day 2009 being participated in by 20,000 museums in over 90 countries. In 2012, the number of participating museums had jumped to 30,000 in 129 countries. We’ve got a pretty good museum for this day, here in Glasgow. A couple of injuries kept me of my bike last year (not cycling injuries I hasten to add), so I ended up looking at more cycling related stories than I might otherwise have done, and what I saw is beginning to worry me. While I understand and appreciate the efforts of most who try to encourage change and encourage improvements, I’ve detected a rise in those who seem to be more interested in attracting attention, or demanding more extreme action be taken to achieve what they think is ‘right’. Over the past few years I’ve seen a steady increase in dedicated cycle lanes (fenced off from adjacent traffic), pedestrian crossing with additional signals for cyclists (to cross some wide and busy roads), plus the arrival of a number of areas with signs showing that they are shared paths for pedestrians and cyclists. I’ve had to use them only as a pedestrian, and didn’t realise how advance this steadily growing network had become in the east end of Glasgow. I think these are great, and make frequent use of them now. Yet when I happened to come across a Glasgow cycling activist’s blog – he was completely against them, called them a mistake, and said they showed the planners didn’t have a clue, and should be fired. As far as I could see, he wanted sole ownership of any bit of road he was using, everbody else is to ‘GEROFF’ and claimed such mixing of pedestrians and cyclists could never work. I suggest he tries riding on the shared path between Central Station and the North Rotunda. That’s busy with both, especially on nice sunny days. The only problem I’ve had on it has been from asshat ‘expert’ cyclists there, who speed round the blind side of corners as if they are the only ones on the path, or like the one I met last night, who sped past me so close he almost scraped the paint off my bike. Not even the courtesy of ding from a bell, or a ‘Sorry mate’ as he sped off. Getting back on my bike, I looked at some recent online route planners – most are pretty poor to be honest, and have not been updated for years, and lack much recent detail. Going by their advice, if I followed it, I’d be on main road as they’re missing many of the lesser cycle paths, and seem surprisingly reticent to use side streets. 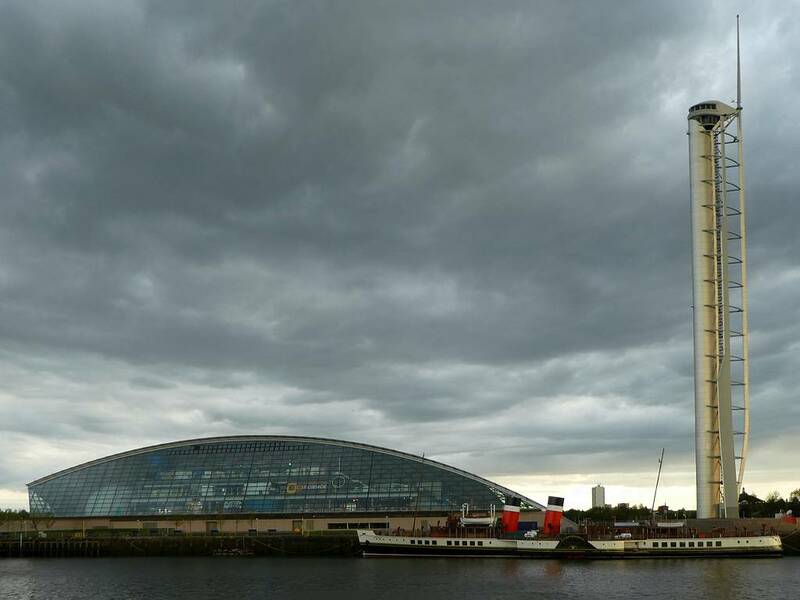 I ride along to the Science Centre fairly often now (from Shettleston), and after checking the online cycle route planners was disappointed they didn’t show a route to Riverside (transport museum), or Kelvingrove (art gallery and museum). But when I was on the other side of the Clyde from the Science Centre I noticed the signs showed that Riverside was only 3 minutes further on, and that Kelvingrove was just another 3 minutes further on. This was new territory for me, so… nothing ventured, nothing gained. True enough, both venues were reached without any problems, and the one hazard on the road to Kelvingrove – crossing the very busy Argyle Street – is catered for by a controlled crossing with signals for cyclists. Here’s the proof of those visits, via a route that’s almost completely segregated cycle path from the east end. Sorry the pics aren’t great – it was as dull and dark then as it appears to be. I’d never have known I could ride to these place almost solely on various cycle paths. And if one ‘activist’ had his way, I wouldn’t even have the route! I believe certain of the ‘activists’ and ‘extremists’ are not helping now. Their actions could even spoil things. PS Waverley. Pics above and below can be clicked for a bit bigger. There are bits of the TS Queen Mary visible in the background, where it is moored behind the tower. Riverside – Museum of Transport. The building extends to the left, but there was a fairly ugly tent there (you can see its reflection) for something else about to take place there, so I decided to get rid of it for the pic. Digging into the ‘cold weather archive’ again, I came across the display for Bennie’s Railplane which can be found in Kelvingrove. The panel (click for bigger) gives enough details for anyone who is unfamiliar, but that’s not what I have in mind. The idea was good enough in itself, and if we look overseas then a number of monorails can be found which have succeeded. But the missing aspect was proper consideration of the engineering and costs – had Bennie been in business with someone who had reeled him in, and ensured the system had been approached in a way that addressed its flaws, then the outcome could have been different. Using a propeller to drive a land craft was not a good idea, but would have seemed like a good idea by following speedy aviation and streamlining ideas which were popular concepts, and innovation would attract funding. In reality, the losses of a propeller driven carriage, and resultant high fuel consumption would have ruined the operating economics, and demanded a change to some sort of mechanical drive (like other systems of the day). Then there was the hugely impractical suspended track, intended to be built over existing railways. However, an honest look at its complexity, and the amount of material consumed compared to the rail tracks which would lie below should soon reveal the dubious wisdom of that part of the system too. There probably wasn’t much that could have been done then to reduce that, barring a complete redesign of the structure, and with the steel and construction methods of the day, there would have been problems. There’s another aspect – that test track only has one line. Two would really have been needed to provide a realistic service in both directions. Or there would have to have been some way of shuffling railplanes back and forth, and around one another on a single track. Given how often single track trains crashed in those days due to signalling errors, can you imagine how long it would have been until the first truly high-speed collision occurred if that had been tried? I guess the lack of any subsequent projects along the same lines (unless we count the Hyperloop, which is yet to become a reality anywhere) is as good an indication as any that Bennie may have had an idea, but that while it looked good, it couldn’t deliver. Having gone from days, to weeks, to years, and now (thankfully), at last, to mere months between visits to Kelvingrove, I’m slowly getting back into the habit of looking for things I’ve missed. Seriously – this is tough when you can’t simply drop in during any weekend. Case in point – the balusters on the front and rear stairways between the floors. I can’t believe it has taken me so many years to remember to stop and look closely at these, such is my general haste to get between the floors these days. But I did remember recently, and was well rewarded for my efforts. I imagine few people stop to look at these, or even notice them. Incidentally, for those unfamiliar, baluster is the name of the vertical spindle between the handrail and (in this case) the tread. I noticed the top of each baluster was a carved figure, but never stopped long enough to see what they actually were. As you will see from the pics below, they are taken from Glasgow’s coat of arms, depicting three of the four elements – I couldn’t find ‘The tree that never grew’, which seems to be missing for some reason, or is perhaps elsewhere. I might ask one day. This is the view down one of the stairwells – not the most brightly lit of places, hence the less than perfect pics. The Bird — Mungo restored life to a robin, which had been tamed by St Serf, but had been killed by some of his classmates, jealous of Mungo as he was favoured by St Serf. The Tree — Mungo had been left in charge of a fire in St Serf’s monastery, but he fell asleep and the fire went out. Taking a hazel branch, he prayed over it and restarted the fire. I’ve been meaning to get this shot together for ages, but just never found the time. It’s not that it could take a lot of time to create, but more that I hadn’t tried one as big or wide as this before, as it was intended to capture almost 180° horizontally and vertically. While it would have been nice to also have a flattened view, I can only afford free software, so can only combine pics taken from a point. I did try to trick the software once, by taking flat shots across a subject, but it just laughed at me, and could not work out how to find and match the edges of the images to be stitched together. This eventually came out reasonably well, being a combination of almost 50 images, each being more than 10 MB. I’m not sure how the top came to be so far off centre – I thought I was standing on the centreline (guess not). There’s ghosting of people since the place was busy, and although this reduced size version of the full stitch doesn’t show it, I really had too much overlap between each image. With fewer images, I usually can’t see the join or any overlap effects. With lots of overlap, the software probably can’t combine the areas without leaving at least some evidence. It’s funny, as I’ve done the same with views of the Winter Gardens at the People’s Palace, where a fairly ordinary wide-angle lens can catch enough of the view from the balcony to make the effort of stitching multiple images more or less pointless. But pointing the same lens at this view inside Kelvingrove? Looking at this final effort, I noticed that it demonstrates one of the seldom mentioned advantages of digital over film. This image shows an exposure range I (as a poor amateur) would never have been able to capture or show using film, as it shows detail in the shadowy dark end of the view, where the organ can be seen, while still showing bright detail in the illuminated lights, and the individual glazing frames within the upper windows, which had the bright sky behind. And this is without any deliberate post-processing to enhance selected detail.